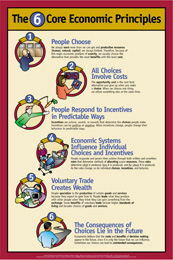 The 6 Core Economic Principles represent six powerful ideas that explain economic behavior. You and your students will discover new insights as you apply these principles to the choices people make in the study of Civics, Economics, Geography, Government, History, and Psychology. Whatever your discipline or grade level, The 6 Core Economic Principles will bring focus to your instruction and better understanding to your students. Incorporate the principles into another subject’s lesson, like the effect an economic decision made in history or government. Create a “choose-your-own-adventure” style game. Pick a group of items, and make your students make a decision about which to choose. Associate a storyline with each item, and have your students identify the core principles as they advance through different scenarios. The 6 Core Economic Principles are aligned with the Voluntary National Content Standards in Economics as well as state standards. The economics vocabulary on the poster (highlighted in bold) emphasizes the important concepts that all students need to know to be well-informed citizens. The 6 Core Economic Principles poster was developed by the Muskegon (Michigan) Area Intermediate School District and the Michigan Council on Economic Education.